Local archaeologists will be returning to Priory Park this July for a second public dig to uncover more of the Roman secrets hidden beneath the ground. Residents and visitors will be able to watch the dig in action from Tuesday 10 July until Sunday 22 July. 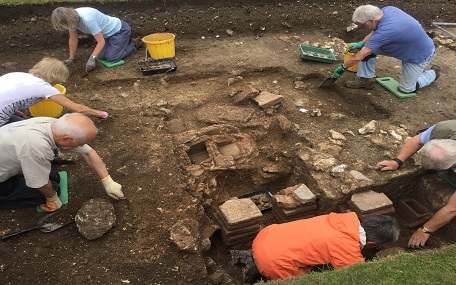 This year's project will extend the work carried out last year, which uncovered the very well preserved remains of part of a Roman bath-house, complete with its underfloor heating system, probably part of a luxurious Roman townhouse, occupied by one of the city's wealthiest citizens. On Saturday 21 July the team will hold a special day for the public, which will include a programme of talks by James to put the work into context and explain what has been found. Last year's event was extremely successful, with hundreds of people turning out to find out more about this unique part of Chichester's history, which has survived untouched for more than 1,600 years. Scans appear to show two large masonry houses, which would now be the equivalent to Chichester's grand Pallant House Gallery building, and would have been owned by someone of great importance. "The first public dig last year was so popular and it was wonderful to see so many people of all ages keen to find out this fantastic piece of history hidden beneath the park," says Susan Taylor, Cabinet Member for Planning at Chichester District Council. "This year even more of the area will be uncovered, giving us an even better understanding of what life was like back in Roman Chichester. "I want to encourage as many people as possible to come along and see the project in action. People can also find out even more by visiting our Novium Museum which has the remains of a Roman bathhouse and a permanent Roman exhibition." James and the team will share their findings on Saturday 21 July during a series of talks scheduled for 10am, 12 noon, 2pm and 4pm.